Excitement is growing about Austin’s newest downtown condominium building at 70 Rainey. Currently under construction, 70 Rainey will bring world-class design and luxury to the Rainey Street Historic District, which USA Today calls "Austin's latest hot spot." Famed interior designer Mark Zeff, founder of the DUMBO, Brooklyn design and architecture firm MARKZEFF, will be creating the interiors for our new Rainey Street condos. If you love quality, convenience, design, and luxury, you owe it to yourself to check out our luxury condo residences before they are all gone. If you love to cook or entertain, you know that Miele has a richly deserved reputation for being one of the top brands for appliances in the world. Our downtown Austin condos at 70 Rainey feature Miele professional appliances, available in fashionable stainless steel or with fronts that match the cabinets. Complementing the Miele kitchen appliances are Kohler professional stainless steel sinks and European cabinets. If you're in the market for a condo, you know how important countertops and other surfaces are to providing an atmosphere of luxury. Our unique living spaces feature only the finest materials. Kitchens in 70 Rainey have fashionable quartz countertops, while bathrooms have lovely marble countertops and marble tile imported from Europe. Floors throughout the units are made of beautiful European wide-planked oak. If you want a feeling of spaciousness and luxury, make sure your living space has high ceilings. At 70 Rainey, ceiling heights range from approximately 10 feet to almost 12 feet. Private terraces add to the feeling of spaciousness, every residence has its own terrace. Selected residences include unexpected luxuries that make life easier and more pleasant. These include Miele wine storage systems, speed ovens, built-in coffee systems, warming drawers, oversized kitchen islands, and, in the bathrooms, freestanding tubs. The attention to detail in these features makes the interiors even more special. The renowned Brooklyn design firm MARKZEFF created custom-designed interior features for 70 Rainey. You'll have a choice of three custom finishes and will enjoy the unmatched quality of MARKZEFF custom-designed kitchens, bathroom vanities, and fixtures and hardware. If you want only the very best, then a luxury penthouse at 70 Rainey is the place to look. Located on the top three floors of our 34-story building, these exclusive luxury penthouses offer commanding views and enhanced interiors. They feature special Miele professional appliance packages, the highest ceilings in the building, and the largest private terraces. 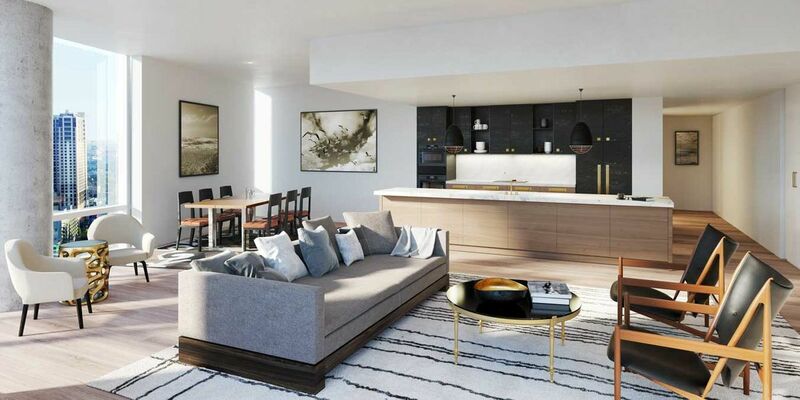 If you are interested in the hottest luxury condos Austin is buzzing about, don't risk being disappointed by waiting too long. Residences are now on sale and are going fast. Contact the sales team at (512) 476-7010, or send an email to info@70Rainey.com today!